For several years I’ve wanted to write an essay on the way that ‘mute beasts’ communicate through gesture in a host of medieval texts (famous examples include the ravens in Bede’s Life of Cuthbert and the lion in Yvain), with some consideration of the way that some monks complained that the use of monastic sign language reduced them to animality. So, a chapter on disability and animals, in terms of muteness, interspecies communication, sign language, and signs, maybe with a strong gesture towards the use of CS Peirce in HOW FORESTS THINK, would be a lot of fun to write. As of yesterday, inspired by conversations with an independent study student, I’m thinking I also need (at least) a section on DEMONS. Why? Because one key symptom of demonic possession is altered speech: the possessed person often can only howl like an animal, or — by the thirteenth century — speaks all too fluently, with the undying reason of the demon, compelled by God or His earthly agents to preach the truth of salvation and holy history. The “mute beast” is anything but mute; the rational demon (“animal aereum, rationale, immortale, patibile, diligentiam hominibus impertiens” eg) is a machine for telling the truth. The one incomprehensible and constrained, the other perfectly, even excessively comprehensible, yet also, quite vividly, constrained. Obviously, given what will be a likely focus on later medieval demoniacs, gender (specially, the disturbance of publicly speaking women) will be a focus. Keywords: agency, voice, truth, authenticity, gender, and the body. Blumenfeld-Kosinski, Renate. “The Strange Case of Ermine de Reims (c. 1347–1396): A Medieval Woman between Demons and Saints.” Speculum 85.02 (2010): 321-356. Craig, Leigh Ann. “The Spirit of Madness: Uncertainty, Diagnosis, and the Restoration of Sanity in the Miracles of Henry VI.” Journal of Medieval Religious Cultures 39.1 (2013): 60-93. In the meantime, I have papers on oysters, fables, medieval race, materialism and gender to revise, write, co-write, and write, respectively. Some of these are not yet due. 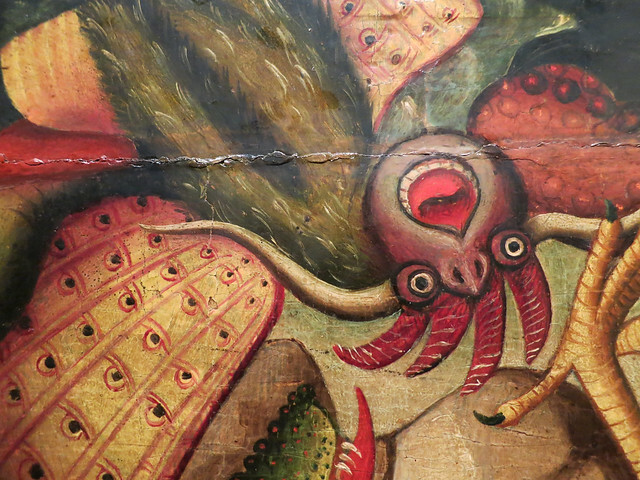 This entry was posted in MedievalBlog and tagged demons, disability, medieval by medievalkarl. Bookmark the permalink.